As the future continues to unfold, a crucial element remains constant, the necessity to serve, sharing with others our experience, knowledge and insight. For over 65 years our founding principle has been to assist our clients in solving their problems and achieving their goals. We seek creative solutions for our clients' business challenges and take pride in their success. Dwight Darby has been our auditors for over a decade, and we continue to be very pleased by the service we receive. We have found their work to meet the highest professional standards of thoroughness and integrity, but more than that, we have been most gratified by the development of our professional relationship. The people at Dwight Darby are consistently open to any question we may have, they have provided expert analysis in both issue awareness and problem-solving. They have helped our business progress through challenges toward a place of much-enhanced stability and strength. The firm's personnel are fluent in multiple platforms, and have, as such, provided our personnel with great assistance and guidance. They are both efficient and warm. Our relationship with Dwight Darby has provided us with great value over the years. It is also clear to us that Dwight Darby values us a client as much as we value them as an essential partner in the growth and success of our business. If you're looking for a certified public accountant (CPA) in the Tampa Bay / Sarasota area, give Dwight Darby a call at 813.251.2411.  We can help with all your accounting, payroll, and bookkeeping needs.